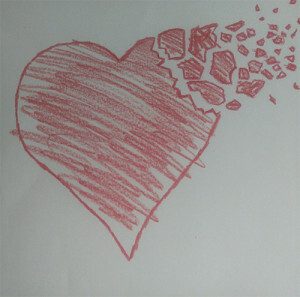 A heart broken. The opposite of a Valentine’s Story. The bleeding had been going on for 10 days and the scans were inconclusive but we knew that meant something was wrong. No, we told them, we haven’t got the dates mixed up. It wasn’t working. Such anger towards this body that was failing me, failing us, failing our developing life. On the 15th February 2016 I was sitting in an odd little side room on the gynaecology ward listening to a faceless doctor tell me that even now, after all the tests and scans, they still couldn’t be sure, but it was probably the case that the pregnancy had failed. There was nothing more they could do. Go home. And so I did, feeling the life stream out of me, completely powerless to do anything to stop it. A piece of my heart broke off that day. Maybe in time the edges will smooth off a little, in the way a shard of glass at the coast is softened by the buffering waves. But there will always be a chunk missing. Wrenched away by spasms of cramps and pains.